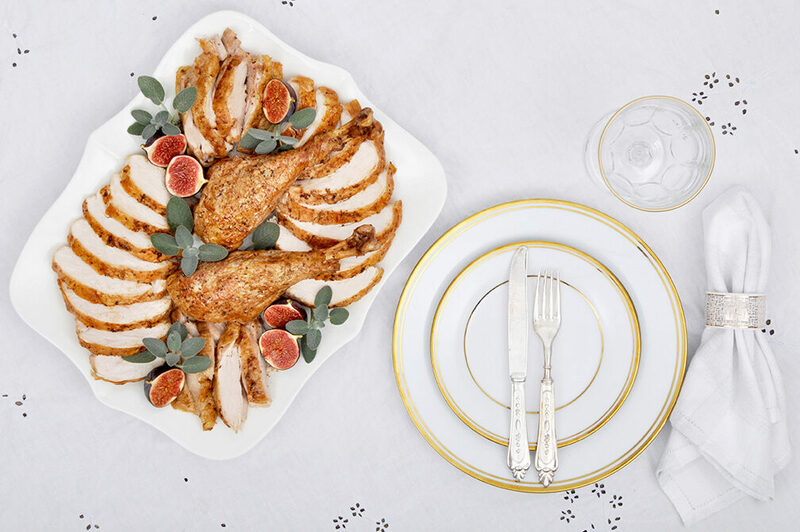 Get your roasted turkey showstopper on the table in record time! Place your carrots, celery, onions and garlic in a large roasting pan. Dress with olive oil and season with a light sprinkle of salt and pepper. Pat the turkey parts dry with a paper towel. Season with salt and pepper. Combine dry spices to make a rub. Sprinkle generously on both sides of the turkey parts. Spread your turkey parts around the pan skin side up. Make sure to leave room between the pieces to allow heat to circulate. If using any fresh herbs, tuck in around the parts. Add the broth and white wine. Roast the turkey for 30 minutes at 425°F. Lower the heat to 350°F and cook for an additional 1- 1½ hours until an instant thermometer inserted into the thickest part of the breast reads 170°F in the breast and 180°F in the thigh. Remove from heat and tent for 30 minutes before carving. Tuck the garlic under turkey parts to ensure it doesn’t burn. Get your local butcher to break down the turkey for you. This is an economical way to use a whole bird for parts, with no extra work for you! Make sure to get the carcass, neck and wings from your butcher to make a rich and tasty turkey stock. 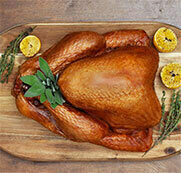 If your local grocer doesn’t have a butcher on site, you can use turkey parts for this recipe. Make sure to stock up on extra dark or white meat, depending on what your family prefers. Pour off pan juices and let sit for 2-3 minutes until the fat rises to the top. Skim off the fat. Blend together remaining pan juices and vegetables to make a delicious gravy. Add a ½ - ¾ cup of broth or milk and 2 tbsps of cornstarch, and heat until thickened to desired consistency.